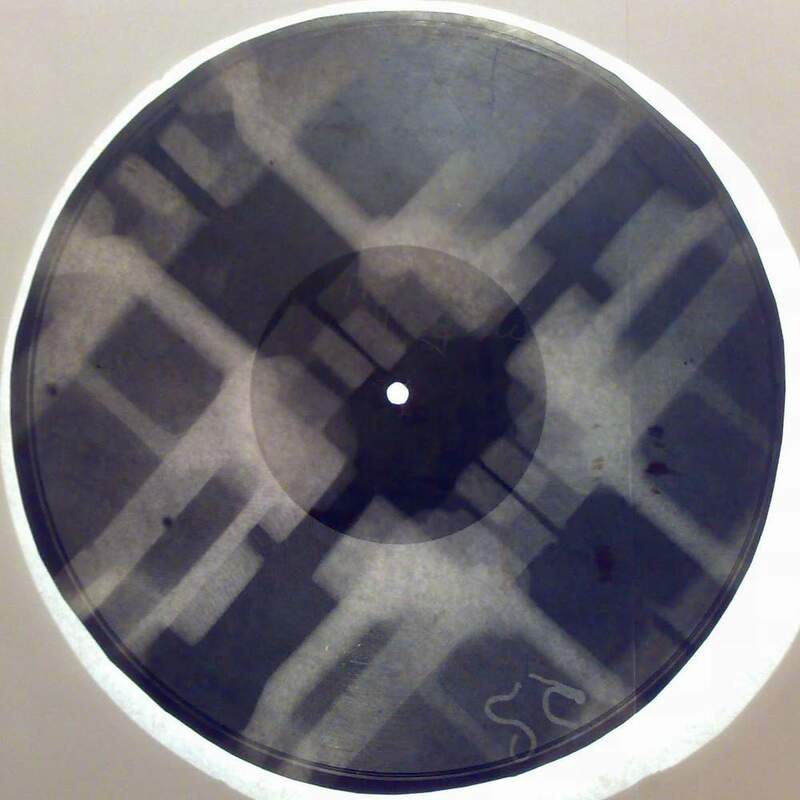 X-Ray plates were used because they were the easiest and most available surface to cut bootlegs records onto, not because of the way they looked. What seems most striking to us - the images of bones - didn't seem to be of much interest compared with the music they contained. Indeed, any other plastic surfaces that would do the trick were used too. The image to the right shows an example. One of the most common alternatives were 'Audio Postcards'. These were a kind of flexi disc that appeared in many countries, including the UK, from the 1940s right through to the 1980s. Novelty recording booths or 'photo studios' where visitors could make a basic recording of their voice leaving a message for the folks back home were common at tourist resorts. The customer would speak into a microphone and the recording machine would cut the sound onto a surface mounted on a picture, usually a photo of the resort. Alternatively, it was possible to choose one of a selection of popular approved songs on the disc or to include a voice message followed by a song. But of course such technology leant itself to other, more illicit uses. So for instance, rather than having a jolly Soviet seaside song, it may be possible for those in the know to request something 'special', a Western Rock and Roll song perhaps. A Russian friend proudly showed me such a disc from the mid sixties. It had an innocuous picture of Yalta, a popular Soviet resort but on the back was written 'The Rolling Stones' (The funny thing was that when we played it, it was in fact....The Doors). By the way, the technology to make these sort of recordings was available back in the earliest days of sound devices as the final image shows. This is from one of the famous 'Leibig' cards (these rather beautiful freebies came in boxes of a German dried meat extract and were collected in albums like the better known cigarette cards).